For review today is a great 3-way driver product in the Audiofly AF160. The AF160 uses 3 balanced armature drivers, and a crossover network. Audiofly may be relatively new to the headphone scene, but these boys from Australia do know their audio stuff! They feature an elegant looking finish and a durable cable. They came in an attractive box with a sleeve with photos and specs of the product. Materials used in the construction were mostly plastic, with some metal and cloth. Quality of materials used were excellent, as was the fit and finish. I love the look of the housing, which was a brown with a bit of a shimmering look to it. Also included was an extremely nice real leather case, owner’s manual, multiple sized and styles of ear tips, cleaning tool, ¼ inch adapter, and airplane adapter. Listening to these gems showed off their amazing aural colors, that was on the warm side. Fresh Aire II: Going To Another Place, revealed very crisp strings with very nice dynamics. Piano was very natural sounding with great resolution. The flute was very smooth with a good amount of air, as well as resolution. The kick drum had nice depth with good kick and presence. Steve Miller Band: Swingtown, percussion was very crisp and clean with excellent resolution. Keyboards sounded natural. Bass guitar was detailed and played with good depth, as did the drums. The vocals were very good with very nice texture. No Doubt: Hella Good, percussion was very crisp and clean with excellent resolution and were very dynamic. Bass was very deep and played with good authority. Vocals were very smooth, sultry and just sounded amazing. Eric Bibb: Don’t Ever Let Nobody Drag Your Spirit Down, guitar was crisp and clean with lots of resolution. Piano was very natural sounding. The string bass had excellent low end extension with amazing resolution and authority. Vocals were pleasantly natural, with excellent texture and harmonics. Imaging was very good, and they threw a good sound stage. Using multiple drivers takes the sound to a whole new level! Audiofly’s AF160’s with their 3 balanced armatures delivered in amazing sound. They tended to be more warm in sound, with excellent resolution, and very good imaging and sound stage. 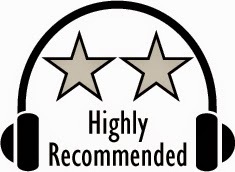 Based on their design, features, quality and performance, the Audiofly AF160 have earned our Highly Recommended Award. For more info and complete specs, checkout their websites at www.audiofly.com.